Jennifer Alfano and Candid. Photos copyright The Book LLC. North Salem, NY – May 7, 2014 – The Old Salem Farm Spring Horse shows awarded their first hunter championships of the season today, and taking the Grand Hunter Championship was Candid, ridden and owned by Jennifer Alfano of Buffalo, NY. In the Grand Prix Field, jumpers had plenty of entries as Darragh Kenny (IRL) and Picolo won over 53 others in the $5,000 Open Jumper 1.40m class. The Old Salem Farm Spring Horse Shows run May 6-11 and May 13-18 at Old Salem Farm in North Salem, NY. The shows feature over 130 hunter and jumper classes each week, bringing together top competitors, including Olympic show jumpers, from across the country to compete for almost $500,000 in prize money. Candid’s performance in the Green Conformation Hunters garnered him the overall Grand Hunter Championship. On the first day, Candid and Alfano were first and third over fences and took the top ribbon in the under saddle and model classes. They finished with two more blue ribbons over fences. The reserve champion in the division was Winston, ridden by Brooke Baldwin-deGrazia and owned by Lannie Lipson. They won an over fences class and took four second places and a third in the rest of the division. Alfano found Candid, who is called “Sheldon” after the TV character on “The Big Bang Theory,” a year ago through Terry Brown. The six-year-old Holsteiner gelding by Quintender was the third horse that she purchased just for herself. 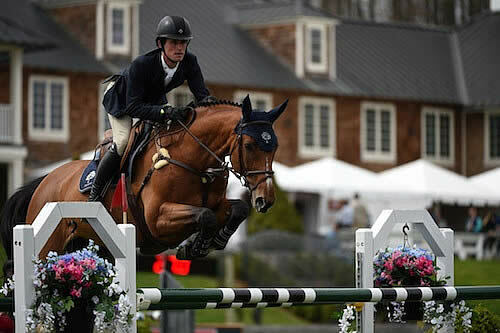 In a class of 54 entries, Darragh Kenny and Picolo, an 11-year-old Selle Francais gelding by Diamant de Semilly owned by Oakland Ventures, took the top spot in the $5,000 Open Jumper 1.40m class with a clear round in a time of 32.493 seconds. Second place went to Balboa 6, ridden by Leslie Howard for Martin Guerra. Their time was 32.709 seconds, while McLain Ward rode Blue Chip Bloodstock’s Dulien van de Smeets to third place in 32.919 seconds. Kenny and Picolo will be back in action for Friday’s $35,000 New York Welcome Stake. Tomorrow’s horse show highlights include Grand Adult Amateur Hunter Championship and another $5,000 Open Jumper 1.40m class. WATCH LIVE! The $50,000 Old Salem Farm Grand Prix on May 11, the $10,000 USHJA International Hunter Derby on May 17, and the $100,000 Empire State Grand Prix on May 18 will all be broadcast on the USEFNetwork.com presented by SmartPak. You may watch these events as they happen at www.USEFNetwork.com or www.oldsalemfarm.net. All classes in the Grand Prix Field and Sand Ring are also livestreamed daily at www.shownet.biz. Visit the Old Salem Farm and Old Salem Farm Spring Horse Shows Facebook pages for results, photo galleries, and more! Old Salem Farm has joined Twitter and Instagram too – follow us to see exclusive photos and videos, let us know what you like about our events, and share your experiences. Old Salem Farm, located just one hour north of New York City, is one of the best equestrian competition venues in North America, as rated by the North American Riders Group in 2011, 2012 and 2013. Host of the Old Salem Farm Spring Horse Shows, the prestigious American Gold Cup CSI-W 4*, and year-round competitions, the facility offers a state-of-the-art turf grand prix field, indoor riding arena, and two all-weather footing rings. As a boarding and training facility, Old Salem Farm is second to none and home to top trainer Frank Madden. For more information, please visit www.oldsalemfarm.net or call 914-669-5610.